All purpose ladder, everyone needs one-Four ladders in One indoors and out Four ladders in One : Step Ladder(twin ladder)/Extension(Straight)/Stairway/Plank Support Superior Stability and Versatility for most Demanding Projects Quick Activating Snap-Lock Hinge One Man Set-Up Heavy Duty Locking Pins Compact design This model gets to you to: Stepladder 3'-5'; Stairway 3' - 5'; Scaffolding 1' - 2'; Extension 7' -11'. 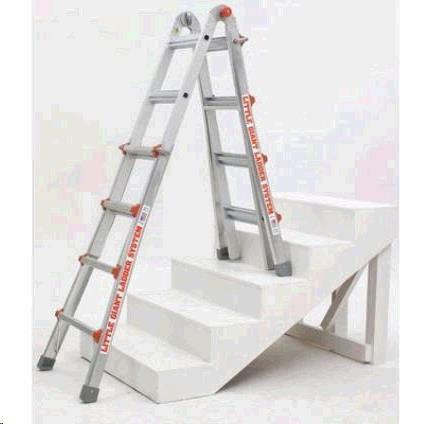 * Please call us for any questions on our ladder stairwell rentals in Salem, Blacksburg, Lynchburg & Smith Mt. Lake VA.